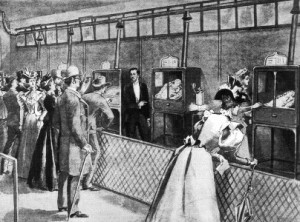 Dr. Martin Couney was the proprietor of “Incubator Baby Exhibits” at many of the large expositions and world’s fairs during the early 1900’s. 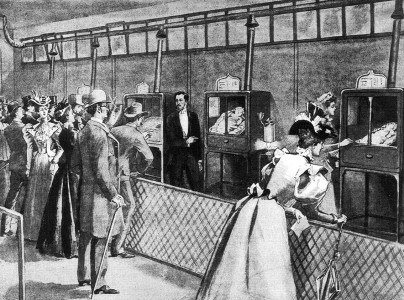 The Baby Incubator exhibit started in 1903 in Dreamland, the more sedate amusement park on the island. The attraction resembled a normal hospital ward, with babies, nurses providing specialized care, and the doctor looking over everything. The only difference was that one side of the ward was glass, and all day long people paid their dime (or fifteen cents, as the years wore on and the prices went up) to troop through and look at the babies. The healthier and older babies were put in incubators along an open hallway, with a railing keeping the public back. The exhibit on Coney Island was a spectacular, and seemingly successful, affair. Outside carnival barkers (including a very young Cary Grant) pulled people into the exhibit. The sign over the entryway proclaimed, “All the World Loves a Baby.” Any child who was prematurely born in the city would be rushed over to Coney Island to be placed in the exhibit, including Couney’s own daughter, who spent three months there. Standards were kept high, and because of the paying customers, Couney never charged any of the parents a penny for the treatment their kids received – even with the cost of care per baby sometimes totaling fifteen dollars a day.